Gasketing Adhesives | Loxeal S.r.l. 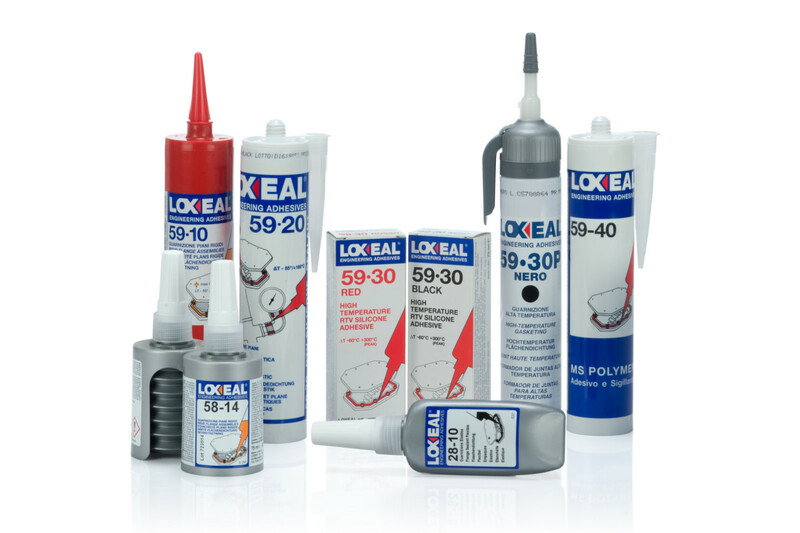 Gasketing Loxeal adhesives seal flat mating surfaces and join flanges on pumps, gearboxes and differential housings of any shape and dimension in an easy and effective way directly from the tube or the cartridge both vertically and horizontally. Guarantee the parts sealing and enhance hydraulic tightness. Anaerobic curing adhesive for the gasketing and sealing of flanges. It replaces solid gaskets and gives elastic cured films. To seal against gases, water, LPG, hydrocarbons, oils and other chemicals. Thixotropic property prevents sealant migration before or during curing. Shocks and vibrations resistant; unaffected sealing properties in the temperature range from -55°C to +150°C. Anaerobic curing adhesive for the gasketing and sealing of flanges. It replaces solid gaskets and gives flexible cured films. To seal against gases, water, LPG, hydrocarbons, oils and other chemicals. Thixotropic property prevents migration of the sealant before or during curing. Shocks and vibrations resistant; unaffected sealing properties in the temperature range from -55°C to +150°C. Shocks and vibrations resistant; unaffected sealing properties in the temperature range from -55°C to +180°C. Loxeal 59-10 is a single component, medium strength anaerobic sealant with good heat resistance. The product cures at ambient temperature when confined in the absence of air between close fitting metal surfaces. For sealing of flat mating rigid flange joints of pumps, gearboxes, camshafts blocks, motor flanges. To replace pre-formed gaskets, allows greater machining tolerances, assures metal to metal contacting and dismantling with normal tools. Highly resistant to vibrations, heat, water, gases, LPG, oils, hydrocarbons and many chemicals. One component moisture curing silicone based sealant and adhesive releasing non corrosive and low-odour by products. Provides an extremely flexible gasket between surfaces made of various materials (metal, plastics, glass, ceramics). Suitable for sealing gear boxes, pumps and motors flanges, oil and water containers, air forced pipes. Resistant to vibrations, thermal shocks, pressurized air, water, oils and several chemicals. Keeps its sealing properties within temperatures of – 50°C and + 180°C. Sealed parts can be disassembled using normal tools. One component moisture curing acetic silicone sealant by reaction. Suitable for sealing gear boxes, pumps, motors and compressors flanges, hot fluid pipes. Provides an extremely flexible gasket between surfaces and resists to vibrations, thermal shocks, water, gas, LPG, oils and several chemicals. Keeps its sealing properties within temperatures of – 60° and + 250°C with peaks up to 300 °C. Sealed parts can be disassembled using normal tools. One component sealing adhesive based on MS polymers. It’s odourless, neutral and free of isocyanates. It cures with moisture producing a tough gum-like seal. Useful to seal glass structures and surfaces, glaze, glazed metal panels, epoxy, polystyrene foam, PVC, steel, anodised aluminium and machined wood. Not suitable for PE, PP, PTFE, bituminous surfaces applications, for underwater application and expansion joints. Not to be painted with alkyl resin colours.